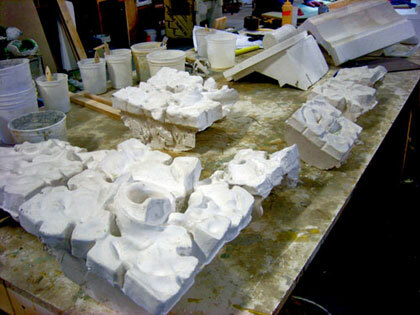 Fabrication has begun of the models needed for the production molds for the thin-shell replicas that will replace the deteriorated terra cotta. 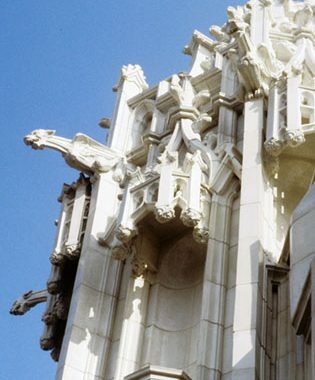 Together with the previous nine phases, more than 60,000 pieces have been replaced making this by far the largest historic reconstruction of its kind in the world. The thin-shell approach was developed in 1986-87 by Elemental (then The Stein Partnership) as a means to rebuild the failing structure on an accelerated schedule and still allow for a cladding that accurately reflected the original material. At the project outset, more than one third of the original terra cotta had already failed and been removed to protect the public safety. 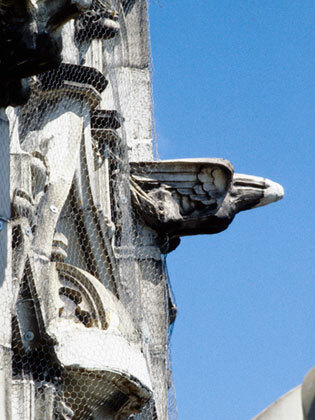 As a result, many of the sculptural elements required either partial restoration or total recreation based on the surviving fragments and old photographs. 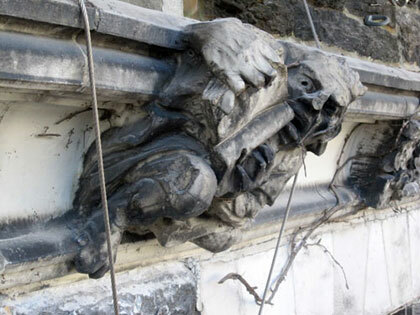 Here, from the first phase (1986-1991) are original grotesques with missing heads, replicas awaiting installation and the rebuilt turrets with the new thin-shell cladding. This process continues today. 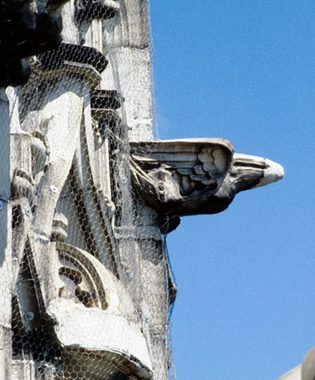 Because the contemporary manufacturing processes offer a much higher level of precision than did the original, care is taken to introduce the imperfections that are characteristic of the terra cotta. 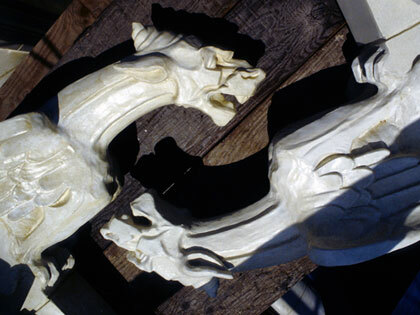 These include tooling marks, irregularities on flat planes and slight variations in the characteristic “white” color from piece to piece. 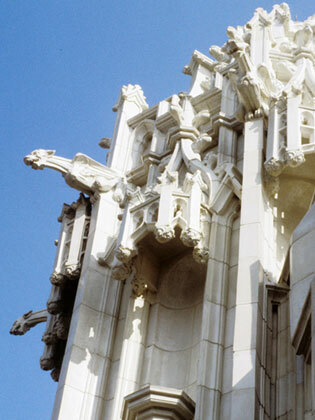 Depending on the level of deterioration of the original terra cotta, the process of obtaining models can vary from the direct use of terra cotta originals as new molds, to partial reconstruction of damaged terra cotta and fabrication of complete recreations based on historic photographs and interpolations from other similar pieces on the building. 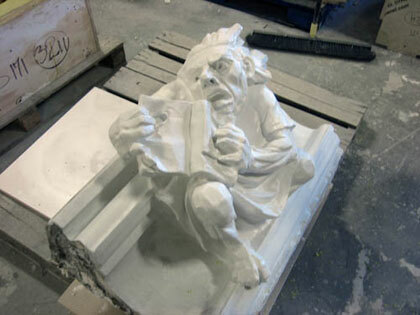 Here, models have been fabricated based on typical profiles found throughout the building In other cases, terra cotta that had suffered minimal damage serves as models, such as these florettes This unique grotesque from the building, missing pieces of his nose and and fingers, was carefully removed from the building and restored to serve as a model for the new GFRC replacement. 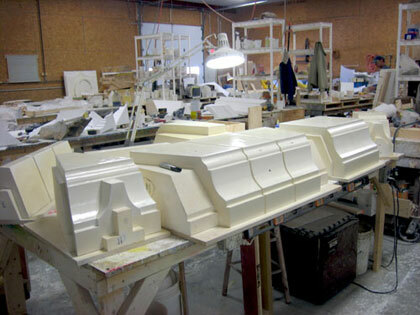 When the models are finished, rubber-lined production molds will be created. The thin shell replacement units (TSRU) are then fabricated using a sprayed glass fiber reinforced cementitious system, about three quarters of an inch thick. The description of the process will continue as the project progresses. Stay tuned for continued updates from the field.